S67-19770 (January 1967) --- The prime crew of the National Aeronautics and Space Administration's (NASA) first manned Apollo Space Flight, named on March 21, 1966, are pictured during training in Florida. Left to right are astronauts Virgil I. Grissom, Edward H. White II, and Roger B. Chaffee. S67-15885 (1967) --- Apollo Spacecraft 012 is hoisted to the top of the gantry at Pad 34 during the Apollo/Saturn Mission 204 erection. S67-50433 (9 Nov. 1967) --- The Apollo 4 (Spacecraft 017/Saturn 501) space mission was launched from Pad A, Launch Complex 39, Kennedy Space Center, Florida. The liftoff of the huge 363-feet tall Apollo/Saturn V space vehicle was at 7:00:01 a.m. (EST), Nov. 9, 1967. The successful objectives of the Apollo 4 Earth-orbital unmanned space mission obtained included (1) flight information on launch vehicle and spacecraft structural integrity and compatibility, flight loads, stage separation, subsystem operation, and (2) evaluation of the Apollo Command Module heat shield under conditions encountered on return from a moon mission. S67-50530 (8 Nov. 1967) --- High-angle view of Pad A, Launch Complex 39, Kennedy Space Center, showing the Apollo 4 (Spacecraft 017/Saturn 501) unmanned, Earth-orbital space mission being readied for launch. The huge 363-feet tall Apollo/Saturn V space vehicle was launch at 7:00:01 a.m. (EST), Nov. 9, 1967. S69-31739 (May 1969) --- The National Aeronautics and Space Administration (NASA) has named these three astronauts as the prime crew of the Apollo 11 lunar landing mission. Left to right, are Neil A. Armstrong, commander; Michael Collins, command module pilot; and Edwin E. Aldrin Jr., lunar module pilot. Rocketdyne's artist concept depicting the firing of the ascent engine as the Apollo 11 Lunar Module (LM) ascent stage is launched from the surface of the moon. The descent stage serves as a launch base and remains on the lunar surface. Inside the LM are astronauts Neil A.Armstrong, commander; and Edwin E. Aldrin Jr., lunar module pilot. Astronaut Michael Collins, command module pilot, remains with the Command and Service Modules (CSM) in lunar orbit while Armstrong and Aldrin explore the moon. The LM ascent stage from the lunar surface and place it in proper trajectory for rendezvous with the CSM. Rocketdyne, a division of North American Rockwell Corporation, is the subcontractor for the LM ascent engine. Grumman Aircraft Engineering Corporation, Bethpage, New York, is the LM prime contractor. AS11-40-5927 (20 July 1969) --- Astronaut Edwin E. Aldrin Jr., lunar module pilot, prepares to deploy the Early Apollo Scientific Experiments Package (EASEP) during the Apollo 11 lunar surface extravehicular activity (EVA). Astronaut Neil A. Armstrong, commander, took this picture with a 70mm lunar surface camera. During flight the EASEP is stowed in the Lunar Module's (LM) scientific equipment bay at the left year quadrant of the descent stage looking forward. Aldrin is removing the EASEP from its stowed position. AS17-134-20382 (13 Dec. 1972) --- Astronaut Harrison H. Schmitt, Apollo 17 lunar module pilot, stands near the deployed United States flag on the lunar surface during extravehicular activity (EVA) of NASA's final lunar landing mission in the Apollo series. 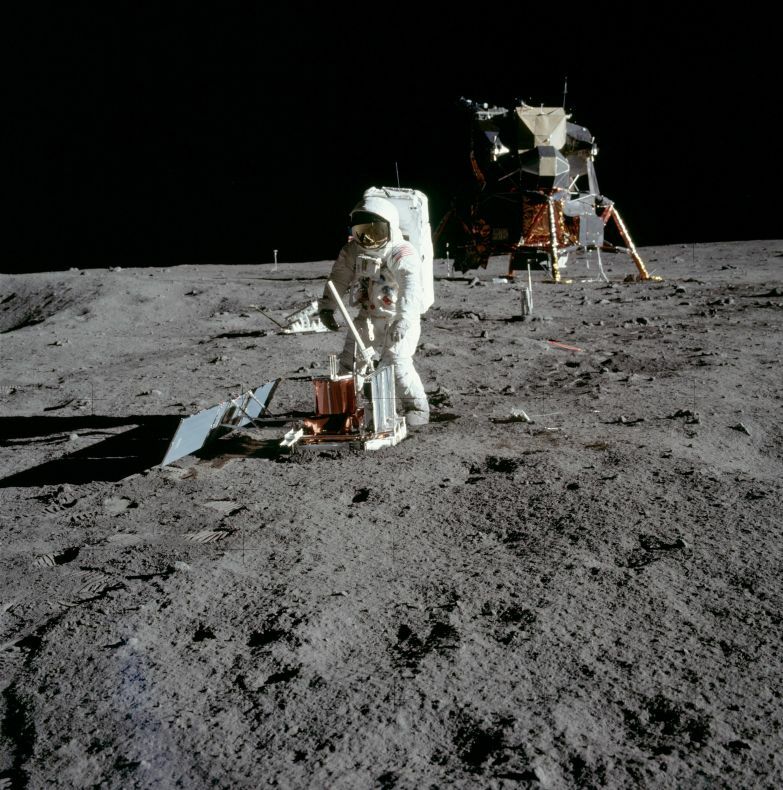 The Lunar Module (LM) is at left background and the Lunar Roving Vehicle (LRV) at right background (partially obscured). The photo was made by astronaut Eugene A. Cernan, commander. While astronauts Cernan and Schmitt descended in the LM "Challenger" to explore the Taurus-Littrow region of the moon, astronaut Ronald E. Evans, command module pilot, remained with the Command and Service Modules (CSM) "America" in lunar orbit. STS129-S-001 (June 2009) --- For STS-129 the sun shines brightly on the International Space Station (ISS) above and the United States below representing the bright future of U.S. human spaceflight. The contiguous U.S., Rocky Mountains, and Great Desert Southwest are clearly visible on the earth below encompassing all the NASA centers and the homes of the many dedicated people that work to make our Space Program possible. The integrated shapes of the patch signifying the two Express Logistics Carriers that will be delivered by STS-129 providing valuable equipment ensuring the longevity of the ISS. The Space Shuttle is vividly silhouetted by the sun highlighting how brightly the Orbiters have performed as a workhorse for the U.S. Space Program over the past 3 decades. The Space Shuttle ascends on the Astronaut symbol portrayed by the Red, White and Blue swoosh bounded by the gold halo. This symbol is worn with pride by this U.S. crew representing their country on STS-129. 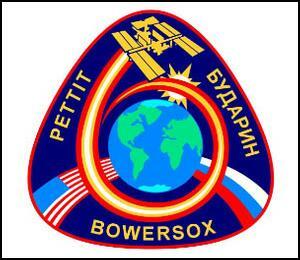 The names of the crew members are denoted on the outer band of the patch. As STS-129 launches, the Space Shuttle is in its twilight years. This fact is juxtaposed by the 13 stars on the patch which are symbolic of our children who are the future. The Moon and Mars feature predominantly to represent just how close humankind is to reaching further exploration of those heavenly bodies and how the current Space Shuttle and ISS missions are laying the essential ground work for those future endeavors. 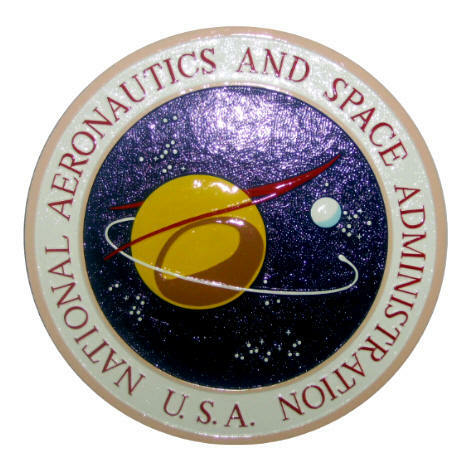 The NASA insignia for design for Shuttle flights is reserved for use by the astronauts and for other official use as the NASA Administrator may authorize. Public availability has been approved only in the form of illustrations by the various news media. When and if there is any change in this policy which is not anticipated, it will be publicly announced. (Note: the description is provided by the crew members). ISS021-E-031717 (23 Nov. 2009) --- Astronaut Robert L. Satcher Jr., STS-129 mission specialist, participates in the mission's third and final session of extravehicular activity (EVA) as construction and maintenance continue on the International Space Station. During the five-hour, 42-minute spacewalk, Satcher and astronaut Randy Bresnik (out of frame), mission specialist, removed a pair of micrometeoroid and orbital debris shields from the Quest airlock and strapped them to the External Stowage Platform #2, then moved an articulating foot restraint to the airlock, and released a bolt on a starboard truss ammonia tank assembly (ATA) in preparation for an STS-131 spacewalk that will replace the ATA. STS129-S-045 (16 Nov. 2009) --- Space Shuttle Atlantis and its six-member STS-129 crew head toward Earth orbit and rendezvous with the International Space Station. Liftoff was on time at 2:28 p.m. (EST) on Nov. 16, 2009 from launch pad 39A at NASA's Kennedy Space Center, Florida. Onboard are astronauts Charles O. Hobaugh, commander; Barry E. Wilmore, pilot; along with Leland Melvin, Mike Foreman, Robert L. Satcher Jr. and Randy Bresnik, all mission specialists. Atlantis will deliver two Express Logistics Carriers to the station, the largest of the shuttle's cargo carriers, containing 15 spare pieces of equipment including two gyroscopes, two nitrogen tank assemblies, two pump modules, an ammonia tank assembly and a spare latching end effector for the station's robotic arm. Atlantis will return to Earth a station crew member, Nicole Stott, who has spent more than two months aboard the orbiting laboratory. STS-129 is slated to be the final space shuttle Expedition crew rotation flight. STS129-S-042 (16 Nov. 2009) --- Space Shuttle Atlantis and its six-member STS-129 crew head toward Earth orbit and rendezvous with the International Space Station. Liftoff was on time at 2:28 p.m. (EST) on Nov. 16, 2009 from launch pad 39A at NASA's Kennedy Space Center, Florida. Onboard are astronauts Charles O. Hobaugh, commander; Barry E. Wilmore, pilot; along with Leland Melvin, Mike Foreman, Robert L. Satcher Jr. and Randy Bresnik, all mission specialists. Atlantis will deliver two Express Logistics Carriers to the station, the largest of the shuttle's cargo carriers, containing 15 spare pieces of equipment including two gyroscopes, two nitrogen tank assemblies, two pump modules, an ammonia tank assembly and a spare latching end effector for the station's robotic arm. Atlantis will return to Earth a station crew member, Nicole Stott, who has spent more than two months aboard the orbiting laboratory. STS-129 is slated to be the final space shuttle Expedition crew rotation flight. STS129-S-048 (16 Nov. 2009) --- Space Shuttle Atlantis and its six-member STS-129 crew head toward Earth orbit and rendezvous with the International Space Station. Liftoff was on time at 2:28 p.m. (EST) on Nov. 16, 2009 from launch pad 39A at NASA's Kennedy Space Center, Florida. Onboard are astronauts Charles O. Hobaugh, commander; Barry E. Wilmore, pilot; along with Leland Melvin, Mike Foreman, Robert L. Satcher Jr. and Randy Bresnik, all mission specialists. Atlantis will deliver two Express Logistics Carriers to the station, the largest of the shuttle's cargo carriers, containing 15 spare pieces of equipment including two gyroscopes, two nitrogen tank assemblies, two pump modules, an ammonia tank assembly and a spare latching end effector for the station's robotic arm. Atlantis will return to Earth a station crew member, Nicole Stott, who has spent more than two months aboard the orbiting laboratory. STS-129 is slated to be the final space shuttle Expedition crew rotation flight. STS129-S-069 (16 Nov. 2009) --- Space Shuttle Atlantis and its six-member STS-129 crew head toward Earth orbit and rendezvous with the International Space Station. Liftoff was on time at 2:28 p.m. (EST) on Nov. 16, 2009 from launch pad 39A at NASA's Kennedy Space Center, Florida. Onboard are astronauts Charles O. Hobaugh, commander; Barry E. Wilmore, pilot; along with Leland Melvin, Mike Foreman, Robert L. Satcher Jr. and Randy Bresnik, all mission specialists. Atlantis will deliver two Express Logistics Carriers to the station, the largest of the shuttle's cargo carriers, containing 15 spare pieces of equipment including two gyroscopes, two nitrogen tank assemblies, two pump modules, an ammonia tank assembly and a spare latching end effector for the station's robotic arm. Atlantis will return to Earth a station crew member, Nicole Stott, who has spent more than two months aboard the orbiting laboratory. STS-129 is slated to be the final space shuttle Expedition crew rotation flight. STS129-S-077 (16 Nov. 2009) --- Space Shuttle Atlantis and its six-member STS-129 crew head toward Earth orbit and rendezvous with the International Space Station. Liftoff was on time at 2:28 p.m. (EST) on Nov. 16, 2009 from launch pad 39A at NASA's Kennedy Space Center, Florida. Onboard are astronauts Charles O. Hobaugh, commander; Barry E. Wilmore, pilot; along with Leland Melvin, Mike Foreman, Robert L. Satcher Jr. and Randy Bresnik, all mission specialists. Atlantis will deliver two Express Logistics Carriers to the station, the largest of the shuttle's cargo carriers, containing 15 spare pieces of equipment including two gyroscopes, two nitrogen tank assemblies, two pump modules, an ammonia tank assembly and a spare latching end effector for the station's robotic arm. Atlantis will return to Earth a station crew member, Nicole Stott, who has spent more than two months aboard the orbiting laboratory. STS-129 is slated to be the final space shuttle Expedition crew rotation flight. STS129-S-090 (16 Nov. 2009) --- Space Shuttle Atlantis and its six-member STS-129 crew head toward Earth orbit and rendezvous with the International Space Station. Liftoff was on time at 2:28 p.m. (EST) on Nov. 16, 2009 from launch pad 39A at NASA's Kennedy Space Center, Florida. Onboard are astronauts Charles O. Hobaugh, commander; Barry E. Wilmore, pilot; along with Leland Melvin, Mike Foreman, Robert L. Satcher Jr. and Randy Bresnik, all mission specialists. Atlantis will deliver two Express Logistics Carriers to the station, the largest of the shuttle's cargo carriers, containing 15 spare pieces of equipment including two gyroscopes, two nitrogen tank assemblies, two pump modules, an ammonia tank assembly and a spare latching end effector for the station's robotic arm. Atlantis will return to Earth a station crew member, Nicole Stott, who has spent more than two months aboard the orbiting laboratory. STS-129 is slated to be the final space shuttle Expedition crew rotation flight. STS129-S-092 (16 Nov. 2009) --- Space shuttle Atlantis and its six-member STS-129 crew head toward Earth orbit and rendezvous with the International Space Station. Liftoff was on time at 2:28 p.m. (EST) on Nov. 16, 2009 from launch pad 39A at NASA's Kennedy Space Center, Florida. Onboard are astronauts Charles O. Hobaugh, commander; Barry E. Wilmore, pilot; along with Leland Melvin, Mike Foreman, Robert L. Satcher Jr. and Randy Bresnik, all mission specialists. Atlantis will deliver two Express Logistics Carriers to the station, the largest of the shuttle's cargo carriers, containing 15 spare pieces of equipment including two gyroscopes, two nitrogen tank assemblies, two pump modules, an ammonia tank assembly and a spare latching end effector for the station's robotic arm. Atlantis will return to Earth a station crew member, Nicole Stott, who has spent almost three months aboard the orbiting laboratory. STS-129 is slated to be the final space shuttle Expedition crew rotation flight. STS129-S-098 (27 Nov. 2009) --- Space shuttle Atlantis touches down on landing Runway 33 of the Shuttle Landing Facility at NASA's Kennedy Space Center, concluding 11 days in space and completing the 4.5-million mile STS-129 mission. Onboard are NASA astronauts Charles O. Hobaugh, commander; Barry E. Wilmore, pilot; Mike Foreman, Leland Melvin, Robert L. Satcher Jr., Randy Bresnik and Nicole Stott, all mission specialists. Main gear touchdown was at 9:44:23 a.m. (EST) on Nov. 27, 2009. Nose gear touchdown was at 9:44:36 a.m., and wheels stop was at 9:45:05 a.m. STS-129 is the final space shuttle Expedition crew rotation flight on the manifest. The crew delivered 14 tons of cargo to the International Space Station, including two ExPRESS Logistics Carriers containing spare parts to sustain station operations after the shuttles are retired next year. STS129-S-099 (27 Nov. 2009) --- Space shuttle Atlantis' drag chute is deployed as the spacecraft rolls toward wheels stop on landing Runway 33 of the Shuttle Landing Facility at NASA's Kennedy Space Center, concluding 11 days in space and completing the 4.5-million mile STS-129 mission. Onboard are NASA astronauts Charles O. Hobaugh, commander; Barry E. Wilmore, pilot; Mike Foreman, Leland Melvin, Robert L. Satcher Jr., Randy Bresnik and Nicole Stott, all mission specialists. Main gear touchdown was at 9:44:23 a.m. (EST) on Nov. 27, 2009. Nose gear touchdown was at 9:44:36 a.m., and wheels stop was at 9:45:05 a.m. STS-129 is the final space shuttle Expedition crew rotation flight on the manifest. The crew delivered 14 tons of cargo to the International Space Station, including two ExPRESS Logistics Carriers containing spare parts to sustain station operations after the shuttles are retired next year. STS127-S-001 (February 2009) --- Space Shuttle mission STS-127 is the 32nd construction flight of the International Space Station (ISS) and the final of a series of three flights dedicated to the assembly of the Japanese "Kibo" laboratory complex. In addition to delivering, installing, and servicing an external scientific platform that will be attached to the end of the Japanese module, STS-127 will bring up a new ISS crew member and return another one to Earth, replace vital components of the ISS electrical production system, and transfer various pieces of hardware to ISS. Five spacewalks and the operation of four different robotic arms will be required to accomplish these tasks over 10 days. A crew spokesperson had the following words for the patch. "Bathed in sunlight, the blue Earth is represented without boundaries to remind us that we all share this world. In the center, the golden flight path of the space shuttle turns into the three distinctive rays of the astronaut symbol culminating in the star-like emblem characteristic of the Japanese Space Agency, yet soaring further into space as it paves the way for future voyages and discoveries for all humankind." The NASA insignia design for shuttle flights is reserved for use by the astronauts and for other official use as the NASA Administrator may authorize. Public availability has been approved only in the form of illustrations by the various news media. When and if there is any change in this policy, which we do not anticipate, it will be publicly announced. S127-E-008456 ((24 July 2009) --- Astronauts Tom Marshburn (right) and Christopher Cassidy, mission specialists for STS-127, share duties on the fourth spacewalk of Endeavour's current mission and its crew's joint activities with the space station. Eleven astronauts and cosmonauts remained inside the International Space Station and the shuttle to which it was docked, while the two continued work on the orbital outpost. The two will team up for the mission's final spacewalk on July 27. S127-E-007786 (22 July 2009) --- Astronaut Christopher Cassidy, STS-127 mission specialist, is pictured in the lower right corner of this wide shot photographed during Endeavour's third space walk of a scheduled five overall for this flight. Cassidy is near the Japanese Experiment Module - Exposed Facility (JEF) This was Cassidy's first of a scheduled three sessions for him. Astronaut Dave Wolf, Cassidy's EVA colleague, is out of frame. S127-E-009343 (27 July 2009) --- Astronauts Christopher Cassidy and Tom Marshburn (mostly out of frame at left), both STS-127 mission specialists, participate in the mission's fifth and final session of extravehicular activity (EVA) as construction and maintenance continue on the International Space Station. During the four-hour, 54-minute spacewalk, Marshburn and Cassidy secured multi-layer insulation around the Special Purpose Dexterous Manipulator known as Dextre, split out power channels for two space station Control Moment Gyroscopes, installed video cameras on the front and back of the new Japanese Exposed Facility and performed a number of "get ahead" tasks, including tying down some cables and installing handrails and a portable foot restraint to aid future spacewalkers. STS127-S-037 (15 July 2009) --- Space Shuttle Endeavour and its seven-member STS-127 crew head toward Earth orbit and rendezvous with the International Space Station. Liftoff was on time at 6:03 p.m. (EDT) on July 15, 2009 from launch pad 39A at NASA's Kennedy Space Center. Onboard are astronauts Mark Polansky, commander; Doug Hurley, pilot; Christopher Cassidy, Tom Marshburn, Dave Wolf, Tim Kopra and Canadian Space Agency's Julie Payette, all mission specialists. Kopra will join Expedition 20 in progress to serve as a flight engineer aboard the ISS. Endeavour will deliver the Japanese Experiment Module's Exposed Facility and the Experiment Logistics Module-Exposed Section in the final of three flights dedicated to the assembly of the Japan Aerospace Exploration Agency's Kibo laboratory complex on the space station. ISS020-E-021320 (17 July 2009) --- This view of the Space Shuttle Endeavour was provided by an Expedition 20 crewmember during a survey of the approaching vehicle prior to docking with the International Space Station. As part of the survey and part of every mission's activities, the STS-127 Endeavour crew performed a back-flip for the rendezvous pitch maneuver (RPM). STS127-S-002 (10 Oct. 2008) --- Attired in training versions of their shuttle launch and entry suits, these seven astronauts take a break from training to pose for the STS-127 crew portrait. Pictured on the front row are astronauts Mark Polansky (right), commander, and Doug Hurley, pilot. Remaining crewmembers, pictured from left to right, are astronauts Dave Wolf, Christopher Cassidy, Canadian Space Agency's Julie Payette, Tom Marshburn and Tim Kopra, all mission specialists. Kopra is scheduled to join Expedition 20 as flight engineer after launching to the International Space Station with the STS-127 crew. STS123-S-001 (Oct. 2007) --- STS-123 continues assembly of the International Space Station (ISS). The primary mission objectives include rotating an expedition crew member and installing both the first component of the Japanese Experimental Module (the Experimental Logistics Module - Pressurized Section (ELM-PS)) and the Canadian Special Purpose Dexterous Manipulator (SPDM). In addition, STS-123 will deliver various spare ISS components and leave behind the sensor boom used for inspecting the shuttle's thermal protection system. A follow-on mission to ISS will utilize and then return home with this sensor boom. A total of four spacewalks are planned to accomplish these tasks. The mission will also require the use of both the shuttle and ISS robotic arms. STS-123 will utilize the Station-Shuttle Power Transfer System to extend the docked portion of the mission to eleven days, with a total planned duration of 15 days. The crew patch depicts the space shuttle in orbit with the crew names trailing behind. STS-123's major additions to ISS (the ELM-PS installation with the shuttle robotic arm and the fully constructed SPDM) are both illustrated. The ISS is shown in the configuration that the STS-123 crew will encounter when they arrive. The NASA insignia design for shuttle flights is reserved for use by the astronauts and for other official use as the NASA Administrator may authorize. Public availability has been approved only in the form of illustrations by the various news media. When and if there is any change in this policy, which is not anticipated, it will be publicly announced. ISS016-E-032312 (12 March 2008) --- An overhead view of the exterior of Space Shuttle Endeavour's crew cabin, part of its payload bay doors and docking system was provided by Expedition 16 crewmembers on the International Space Station (ISS). Before docking with the station, astronaut Dominic Gorie, STS-123 commander, flew the shuttle through a roll pitch maneuver or basically a backflip to allow the space station crew a good view of Endeavour's heat shield. Using digital still cameras equipped with both 400 and 800 millimeter lenses, the ISS crewmembers took a number of photos of the shuttle's thermal protection system and sent them down to teams on the ground for analysis. A 400 millimeter lens was used for this image. ISS016-E-033091 (18 March 2008) --- Backdropped by a blue and white section of Earth and the blackness of space, Space Shuttle Endeavour's starboard wing, a portion of its payload bay and part of its orbital maneuvering system (OMS) pods are featured in this image photographed by a crewmember during the STS-123 mission's third planned session of extravehicular activity (EVA). ISS016-E-032581 (12 March 2008) --- Backdropped by a blue and white Earth, Space Shuttle Endeavour approaches the International Space Station during STS-123 rendezvous and docking operations. 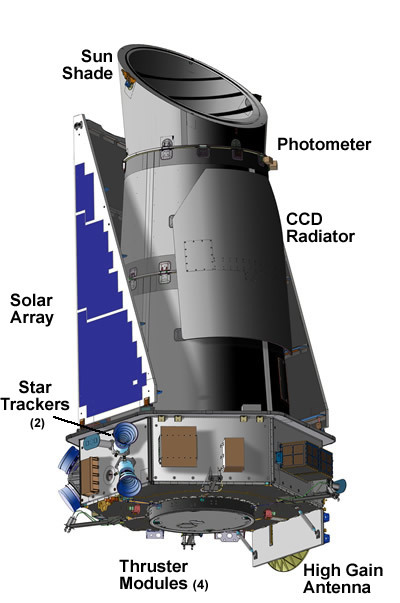 Docking occurred at 10:49 p.m. (CDT) on March 12, 2008. The Canadian-built Dextre robotic system and the logistics module for the Japanese Kibo laboratory are visible in Endeavour's cargo bay. A Russian spacecraft, docked to the station, is visible in the foreground. STS117-S-001 (May 2007) --- The STS-117 crew patch symbolizes the continued construction of the International Space Station (ISS) and our ongoing human presence in space. The ISS is shown orbiting high above the Earth. Gold is used to highlight the portion of the ISS that will be installed by the STS-117 crew. It consists of the second starboard truss section, S3/S4, and a set of solar arrays. The names of the STS-117 crew are located above and below the orbiting outpost. The two gold astronaut office symbols, emanating from the '117' at the bottom of the patch, represent the concerted efforts of the shuttle and station programs toward the completion of the station. The orbiter and unfurled banner of red, white, and blue represent our Nation's renewed patriotism as we continue to explore the universe. The NASA insignia design for space shuttle flights is reserved for use by the astronauts and other official use as the NASA Administrator may authorize. Public availability has been approved only in the form of illustrations by the various news media. When and if there is any change in this policy, which is not anticipated, such will be publicly announced. ISS015-E-11743 (10 June 2007) --- A view photographed from the International Space Station shows the Space Shuttle Atlantis from the aft looking forward as the two spacecraft were nearing their much-anticipated link-up in Earth orbit. The 17.8 ton S3/S4 truss to be added next week to the station can be seen berthed in the payload bay of the shuttle. STS117-S-050 (22 June 2007) --- With drag chute deployed, Space Shuttle Atlantis slows to a stop after landing on runway 22 at NASA's Dryden Flight Research Center at Edwards Air Force Base in California concluding a successful assembly mission to the International Space Station. Atlantis landed on orbit 219 after 13 days, 20 hours and 12 minutes in space. 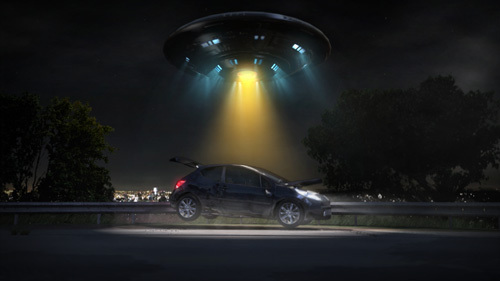 The landing was diverted to California due to marginal weather at the Kennedy Space Center. Main gear touchdown was at 12:49:38 p.m. (PDT). Nose gear touchdown was at 12:49:49 p.m. and wheel stop was at 12:50:48 p.m. This was the 51st landing for the Space Shuttle Program at Edwards Air Force Base. The mission to the station was a success, installing and activating the S3/S4 truss and retracting the P6 arrays. Onboard were astronauts Rick Sturckow, commander; Lee Archambault, pilot; Jim Reilly, Steven Swanson, Patrick Forrester and John "Danny" Olivas, all STS-117 mission specialists. Also onboard was astronaut Sunita Williams, who was flight engineer on the Expedition 15 crew. She achieved a new milestone, a record-setting flight at 194 days, 18 hours and 58 minutes, the longest single spaceflight ever by a female astronaut or cosmonaut. STS117-S-053 (22 June 2007) --- Accompanied by a convoy of recovery vehicles, the Space Shuttle Atlantis is towed up the taxiway at NASA Dryden Flight Research Center following a successful landing at 12:49 p.m. (PDT) on June 22, 2007 at Edwards Air Force Base in California. 97-17424 (December 10, 1997) --- The airlock for the International Space Station is lifted by crane in the fall of 1997 during manufacturing in the Space Station Manufacturing Building at the Marshall Space Flight Center in Huntsville, Al. The airlock includes two sections: the larger "equipment lock" on the right that will store spacesuits and associated gear and the narrower "crewlock" on the left from which astronauts will exit into space. The airlock is 18 feet long and has a mass of about 13,500 pounds. It will be launched to the station aboard Space Shuttle mission STS-100 in August 1999. The addition of the airlock will enable U.S. astronauts on the station to perform spacewalks without a shuttle present. Orbital assembly of the International Space Station is scheduled to begin in the summer of 1998. STS104-332-026 (21 July 2001) --- The International Space Station (ISS), just days after receiving the installment of the Quest airlock, was photographed by one of the STS-104 astronauts during a fly-around of the orbital outpost. The survey occurred shortly after Atlantis' undocking. The Canadarm2 or Space Station Remote Manipulator System (SSRMS) appears to be pointed toward the new airlock on the station's starboard side. The STS-104 and Expedition Two crew's joint efforts in the past several days, in which the airlock was installed and other work was accomplished, marked the completion of the second phase of the station. Within the last year (beginning in July of 2000), 77 tons of hardware have been added to the complex, including the Zvezda module, the Z1 Truss Assembly, Pressurized Mating Adapter 3, the P6 Truss and its 240-foot long solar arrays, the U.S. laboratory Destiny, the Canadarm2 and finally the Quest airlock. 97-17425 (December 10, 1997) --- The first of four "stand-off" structures is shown installed inside the U.S. Laboratory module for the International Space Station. Installed in August 1997, the stand-offs provide space for electrical connections, data management systems cabling for computers, air conditioning ducts, thermal control tubes and more, all of which support the space station's equipment racks. The aluminum U.S. lab module is 28 feet long and 14 feet in diameter. The lab is scheduled to be launched to the station aboard the Space Shuttle in May 1999 on shuttle mission STS-98. Assembly of the International Space Station, a combined effort of 16 countries led by the U.S., is planned to begin in the summer of 1998. STS100-E-5958 (29 April 2001) --- Backdropped against the blue and white Earth and sporting a readily visible new addition in the form of the Canadarm2 or space station robotic arm, the International Space Station (ISS) was photographed following separation from the Space Shuttle Endeavour. With six astronauts and a Rosaviakosmos cosmonaut aboard the shuttle, the spacecraft performed a fly-around survey of the station, which was inhabited by two astronauts and a Russian cosmonaut. The image was recorded with a digital still camera. STS100-E-5238 (22 April 2001) --- Astronaut Chris A. Hadfield, STS-100 mission specialist representing the Canadian Space Agency (CSA), stands on one Canadian-built robot arm to work with another one. Called Canadarm2, the newest addition to the International Space Station (ISS) was ferried up to the orbital outpost by the STS-100 crew. Hadfield's feet are secured on a special foot restraint attached to the end of the Remote Manipulator System (RMS) arm, which represents one of the standard shuttle components for the majority of the 100-plus STS missions thus far. The picture was recorded with a digital still camera. JSC2006-E-21457 (June 2006) --- NASA's Constellation Program is getting to work on the new spacecraft that will return humans to the moon and blaze a trail to Mars and beyond. 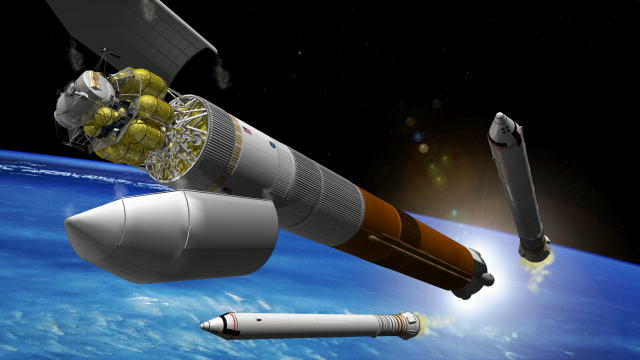 This artist's rendering represents a concept of rendezvous and docking operations between a crew exploration vehicle (CEV) and a lunar lander and departure stage. JSC2009-E-218749 (23 Sept. 2009) --- Using mock-up components, technicians at the U.S. Army's White Sands Missile Range in New Mexico practiced the stacking process that will one day be involved in mating the Orion Pad Abort-1 flight test launch abort system and crew module hardware. The crew module was integrated with the PA-1 test separation ring and launch stand. The launch abort system, crew module and separation ring were developed at Langley Research Center, Hampton, Va. The launch stand and pad were developed at Dryden, where crew module systems were integrated. Dryden is leading the launch abort flight tests effort for the Orion Project Office, managed at the Johnson Space Center, Houston.